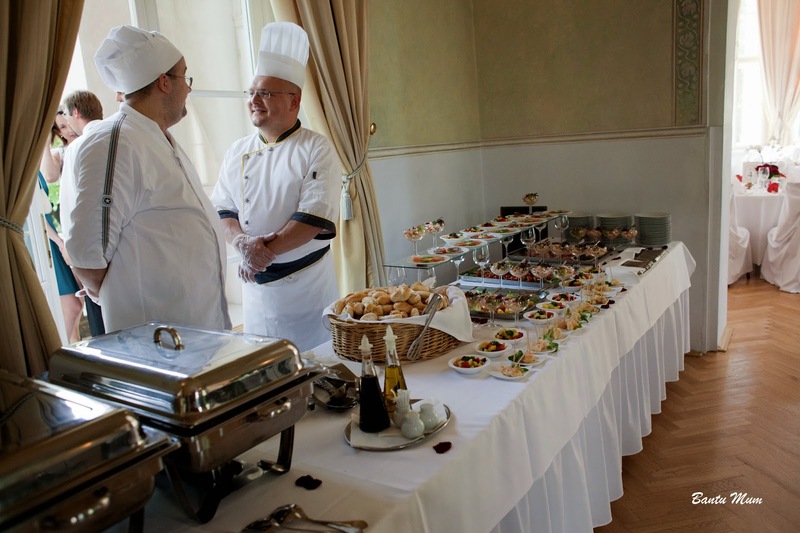 Your wedding menu can be tailored to the eating habits of the larger number of your guests. I collected this information through my wedding website. Some brides-to-be prefer sit down 6 course meals with a touch of elegance about them. Others prefer buffet. Others might just decide to offer only finger food. Budget is a key player seeing as it's not cheap feeding a large number of people. We included plenty of choice for our guests. We had a lot of meats on our menu, but so did we vegetables, fish and fruit. We also included finger food to go with the welcome drinks and cheeses, meats and fruit platters for late evening. We provided menus (DIY project) on each table so our guests had an idea what was being served before going to the buffet table. Just to give you an idea what's possible, here's my wedding menu. Food presentation and serving was in the hands of catering stuff. This soup, as Czech tradition dictates, is served to all guests. I decided against this. Only the Bride and Groom got the soup and performed the Czech Soup Tradition which involved being wrapped in a white cloth and feeding each other soup. I eliminated the former. Wedding cake was the main desert. Read more in selecting your wedding cake.